As you probably noticed in my last post, I got kind of depressed when my egg yolk reintroduction wasn’t successful. One of the major reasons I was depressed is that eggs are so standard in baking. This meant that I’d always have to be careful with baked goods and at the minimum observe extra moderation with them. So what do you do when you’re feeling blue? Whether it’s election blues or egg yolk blues? You bake, of course! Early in my AIP adventures, I was missing chocolate. One of the easiest chocolate substitutions is cacao, although it doesn’t agree with everyone. In my enthusiasm at learning it’s on the protocol, I bought cacao powder and chips. Unfortunately I later learned there are a few ingredients that make the chips non-compliant, so I should have made my own, but since I had them on hand, I decided to indulge a little in this case. As I worked on healing and mourning the loss of eggs, I got to work tracking down ingredients for this recipe. 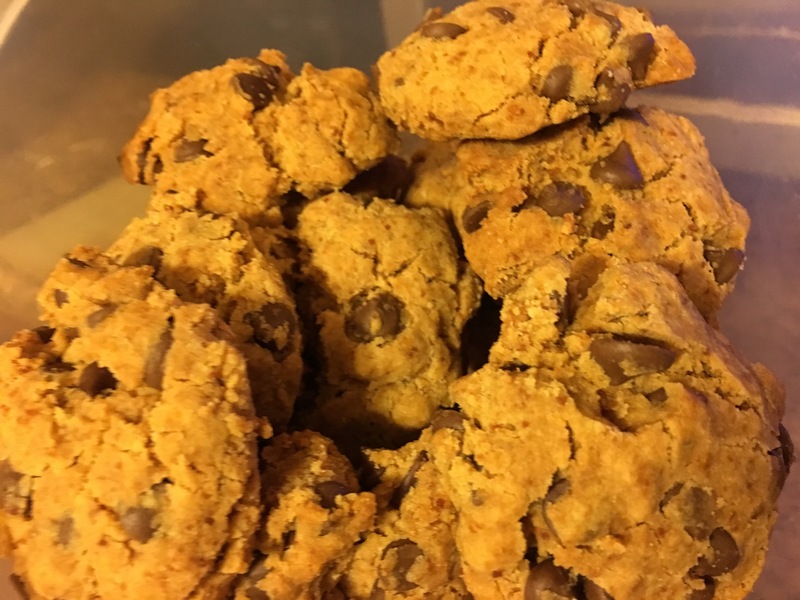 Flame to Fork is where I found this recipe for AIP, Chewy “Chocolate” Chip Cookies. 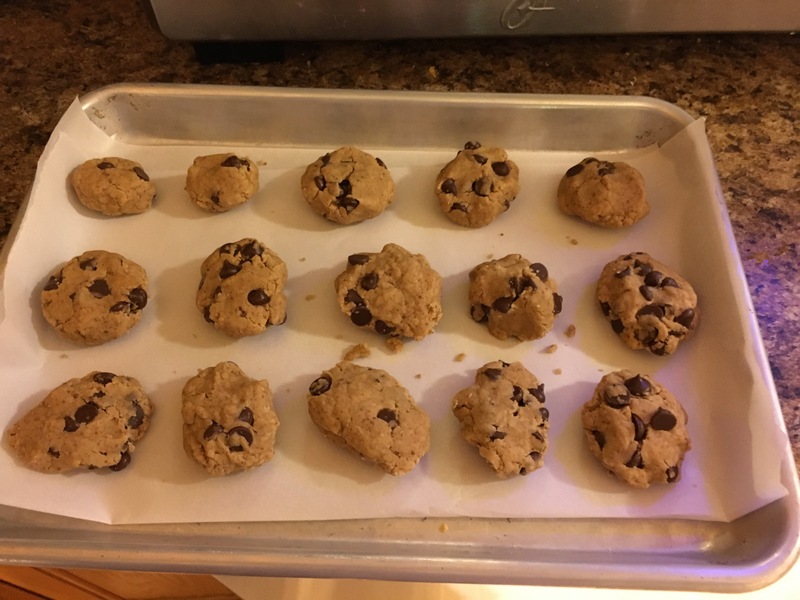 I substituted arrowroot powder for tapioca powder, since it’s what I had on hand, and I think it made them a little extra dense and more akin to a chocolate peanut butter cookie if that sounds good to you. First you mix a bunch of stuff. I found it a tad crumbly so increasing the liquids slightly might have helped. And I tripled the recipe since we’re staying with friends and I wanted lots of cookies! Next you roll them into balls. 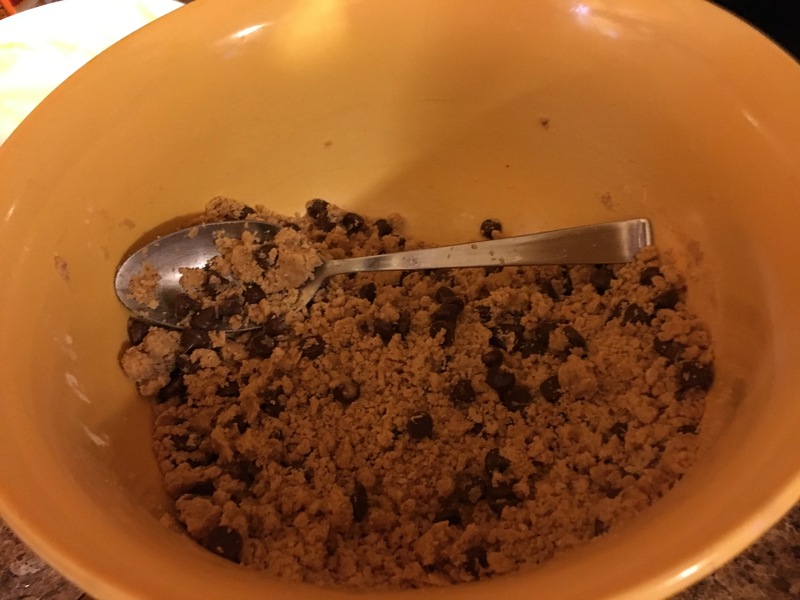 This took way more time than regular cookie dough. But they will do the job, particularly if you follow the instructions and let them set a bit before you remove or eat them. These took a while to cook. It can be hard to tell they’re done because they don’t burn as obviously as traditional cookies. So err on the side of less time if you’re unsure. After all, there aren’t any eggs, so you can even eat this as cookie dough without fear! I’m crazy about these cookies. So is my husband. If I had controlled myself and not eaten 6-8 in a day, I think I would have been fine with the store-bought chips, but next time my digestion will thank me when I make them myself. And if my husband has his way, I will be making them a lot! If you have trouble finding the ingredients, check Amazon. Depending on the area I’m in, I’ve found most of these ingredients at Walmart or local grocery stores and just about everything at a local food cooperative. One final note: a quick fast-food story. We just spent a couple of days in Minneapolis and of course visited the Mall of America while we were there. I was prepared with meat and fruit bars, but I was hoping for some fast food I could eat without paying for a sit down meal. 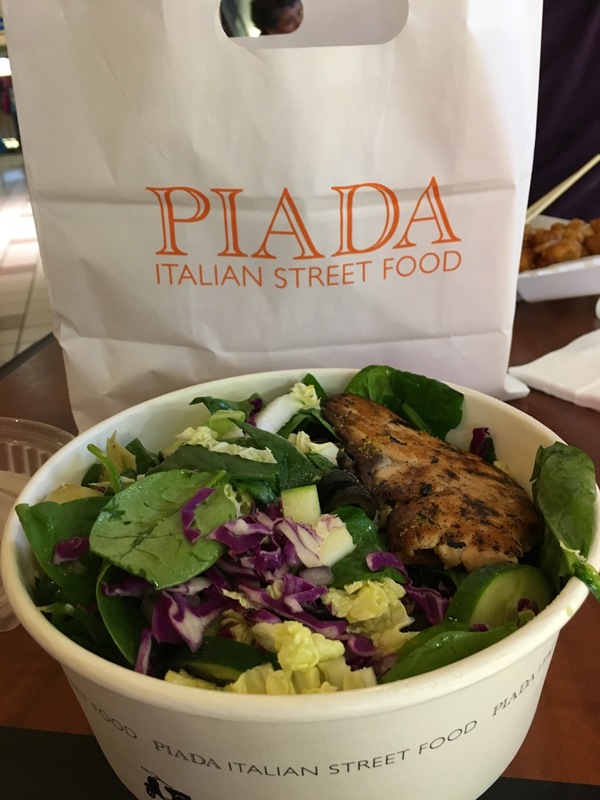 A quick search hadn’t turned up anything, but finally I thought to ask Piada Italian Street Food what oil they use on their grill. When they showed me the bottle of olive oil I got so excited! I had a fantastic salmon salad – they let me substitute things I could eat (olives, cucumbers, artichokes) for things I couldn’t and talked me through every ingredient. Amazing service, amazing meal and I can’t recommend them more highly for a healthy and delicious fast casual experience! Look for them in a city near you in Ohio, Indiana, Minnesota or Kentucky. Thanks for reading, and stay strong! We are so much more than the food we eat but it sure does influence how we feel.